Pure Fun makes some great trampolines. 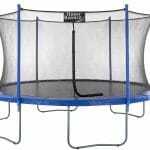 Before you buy, you might want to read some Pure Fun trampoline reviews to see which of their offerings will work the best for your family. Different sizes and different features work better for different households. All you need to know is how many children you have, their ages, and how much space you have for a trampoline. From there, it’s easy to find the perfect trampoline that they’ll love for years to come. Pure Fun is one of the only companies that makes a trampoline in this style. 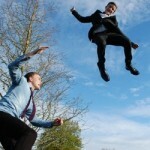 Younger kids who may not be so stable on their feet will really be able to jump with a Pure Fun mini trampolines. These models have small jump spaces and a foam padded support bar. To use the trampoline, your child holds onto the bar as they jump. Toddler jumpers have a tendency to topple over when jumping on a traditional trampoline. They’re still relatively new to walking, and balance is a skill that they’re continuing to develop. By using the bar on this trampoline, little kids can become more aware of their center of gravity. 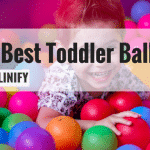 It’s a safer way for a toddler to burn out some extra energy and get a little exercise. As the young child develops his or her skill, they can move on to a full sized trampoline. It’s easier for little jumpers to learn on this trampoline. Rather than falling over, they’ll have something to hold on to in order to help them stay upright. Since this trampoline is so small, it will fit anywhere. It can be used indoors or outdoors. 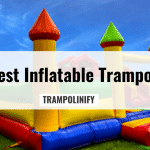 For extra security, it’s easy to surround the trampoline with foam padded floor mats when used on hard surfaces, or place it on carpeted flooring. 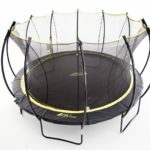 Much less expensive than buying a full sized trampoline, especially if you don’t need one. It’s a great alternative for single-child households with young children. Since this trampoline is only designed to be used up to age 7, your child will eventually outgrow it. Only one child at a time can use this trampoline because of the foam padded safety bar. If you have one toddler that’s always anxious to play, you’re going to love this trampoline. 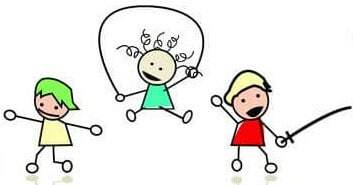 A lot of parents are constantly looking for ways to get a toddler engaged in active play, especially if there are no other children around to play with. Set this up in the living room and keep an eye on your child while you’re folding the laundry. They’ll be having safe fun and getting necessary exercise, and you’ll be able to monitor them easily. 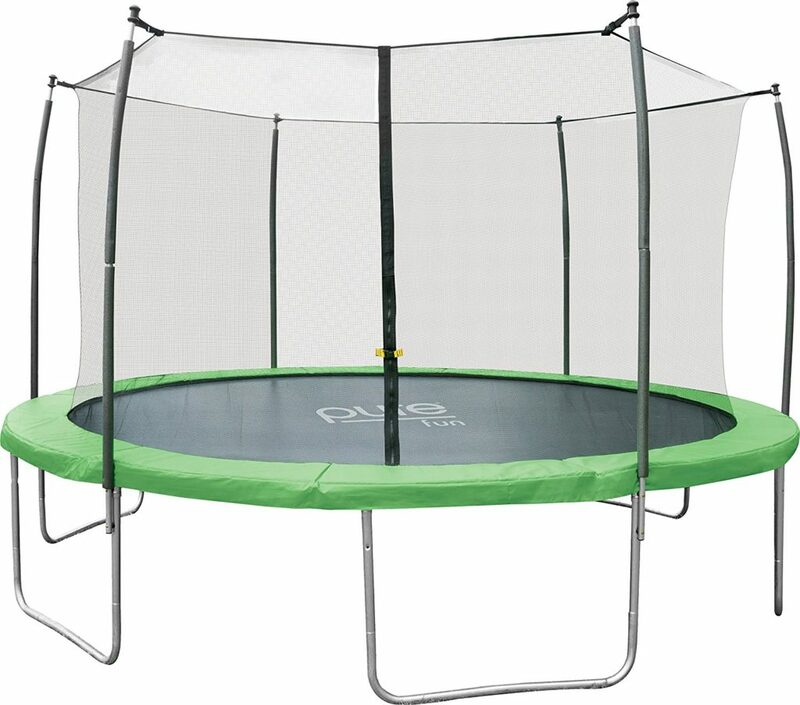 This Pure Fun 14-foot trampoline offers plenty of space for kids of all ages to jump. If you have multiple children who will want to jump together, you’ll appreciate the square footage of this large jump pad. The maximum weight capacity is a staggering 350 pounds, which means an adult may even be able to safely jump with a child. Not many trampolines are designed to accommodate three middle school aged children at once, but this one is up to the task. The jump pad is surrounded by an included enclosure net that connects around the padding. This internal enclosure makes it far less likely that a child can be pinched by the springs, or fall through any of the gaps. Since the enclosure zips and locks, you won’t have to worry about kids falling through an open space. The 6 u-shaped legs make for maximum stability, and the weatherproofed materials won’t degrade from constant exposure to sunlight. Your kids won’t outgrow this trampoline. With such a high weight limit, they’ll be able to use it all the way into high school. Adults can jump too, and that’s always a bonus. The frame is reinforced with t-brackets that provide additional stability. On top of its steel construction and balanced legs, you’re also getting more strength from these special brackets. This trampoline is highly unlikely to break. If you have multiple children who will want to jump at once, this trampoline is designed exactly for this purpose. Alternatively, if you have an only child who likes to have friends over during the summer or after school, everyone will be able to enjoy it together. It’s pricier than some similar trampolines, but you get what you pay for. 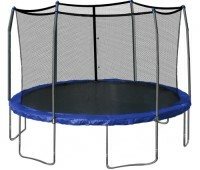 Less expensive trampolines often have lower weight limits and are constructed of subpar materials. This trampoline can do everything. If you’re looking at Pure Fun trampoline reviews specifically to find the most durable and reliable product they offer, this is the one. It can handle rowdy teenagers as well as bouncy toddlers. It can withstand rigorous use, and it’s designed to last an eternity. This is the kind of trampoline that, if well maintained, you can still use when you have grandchildren. If you want to make the best investment, this is going to be a superior selection. The Pure Fun 12 foot trampoline is great for families that want a full sized outdoor trampoline, but may not have enough space in their yard for a giant model. Twelve feet of jumping space is modest, but it’s certainly enough for your children to play on. Like most Pure Fun outdoor trampolines, the weight limit is rather high. Because it can accommodate up to 350 pounds, many children will be able to enjoy it together. Pure Fun utilizes an enclosure net system that secures around the jump pad. This eliminates the gaps between the jump pad and the springs, which is frequently a safety concern. Bouncing children can stumble through the springs, getting their legs caught or their skin pinched. This is almost impossible with an internal enclosure net. Children can be zipped and locked in, and are kept safe during high bounces or flips. This trampoline was designed with safety in mind, and children will only require minor supervision once they’ve perfected their trampoline jumping skills. With such a high weight limit, you can be certain that your children will never outgrow this trampoline. They’ll be able to enjoy it with their siblings or their friends, as the springs are designed to hold up to use by multiple jumpers. The enclosure net, jump pad, and spring protectors are all made of UV resistant materials. This means the sun won’t fade the material or make it brittle. The metal is weatherproofed and rust resistant, so rain or snow won’t affect the durability. You can keep this up outside all year round. The compact size means that this trampoline is easy to fit in smaller back yards. If you live in a townhouse or a duplex, this trampoline is likely the perfect diameter. 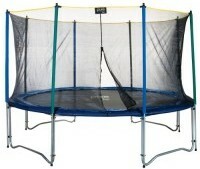 Since the size is smaller, children may not have enough space to play games or use accessories with the trampoline. If they’re mainly looking to bounce, this shouldn’t be a significant issue. This is a traditional trampoline in a smaller size. This may be the only size you can fit in your yard, and you won’t have to compromise on safety or quality. Pure Fun makes some of the safest trampolines available, no matter the size. Their high weight limits and assured durability makes all of their trampolines great investments, and this one is no exception. If you’re struggling to figure out where you’ll put a trampoline, you’ll be satisfied with the compact size of this model. This Pure Fun kids trampoline is certainly one of a kind. It’s an indoor/outdoor trampoline designed with young learners in mind. The trampoline is lower to the ground, limiting the height of jumps and making it safer for youngsters. It’s completely covered by a tall enclosure to prevent children from falling off of the surface, and the springs are covered by an extra thick padding. The jump pad itself features a tic tac toe board, and children can use regular sidewalk chalk to play the game. They can draw on the trampoline, and it’s easy to wash off. The enclosure net poles are padded with foam, and the metal frame is coated in a durable plastic. 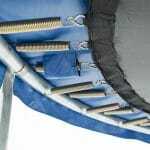 This means that the trampoline won’t scuff or damage indoor flooring, so you can set it up on a back porch, in a garage, or in a mud room. Children can use this trampoline regardless of weather. It can be moved inside when it’s especially hot outside, during a storm, or when it’s snowing. Your children will be able to bounce year-round. The bonus feature of the chalk makes this trampoline fun. This makes the trampoline not only a valuable tool for the exercise your children need, but also a large surface to create artwork. It serves two purposes. 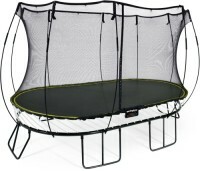 Perfect for families with two younger children who may not need a large trampoline. This trampoline is only designed for younger children. Children in middle school or teens won’t be able to make use of it, due to the small jump pad size and low weight limit. This trampoline is very versatile. The ability to jump indoors keeps your children active no matter what the season or weather conditions are. When used inside, this trampoline won’t be damaged by falling leaves, twigs, or harsh storms. Since the jump pad is also a giant chalkboard, it acts as two toys in one. Younger children will appreciate this indoor trampoline, and you’ll be able to supervise them while you’re tending to indoor tasks. You’ll get the most use out of this trampoline, and it removes many of the restrictions that affect a child’s ability to jump outdoors. An 8 foot trampoline isn’t very big, but that may be exactly what you need. If you don’t have much of a yard, a trampoline of this size might be the solution. If you live in an apartment or a condominium, you probably have little to no space outside. 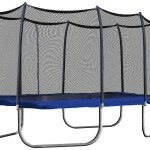 A smaller diameter trampoline is the perfect compromise, and it’s perfect for households with only one child. If your child desperately wants a trampoline and you have no idea where you’re going to put it, an 8 foot trampoline makes the logistics a lot easier. This trampoline is built on a round frame which allows maximum bounce for its modest size. It’s completely encircled by a safety enclosure net to keep your child safe. The net itself is suspended by four evenly spaced poles, and the enclosure shuts securely with a simple “L” shaped zipper mechanism. Perfect for single child households. This trampoline is designed to handle one jumper at a time. If you’re low on space, this size may be the only way you can purchase a trampoline for your child. 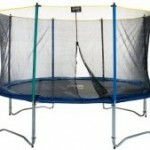 Allows children to bounce high, unlike many smaller diameter trampolines. Not meant for multiple children to use at once. This trampoline is small, and only designed to withstand one jumper at a time. Overloading the trampoline can put too much stress on the frame, causing the poles to bend. If you’re pressed for space and you still want to be able to provide your child with a toy that will encourage them to exercise, you’ll appreciate the compromise on size. A single child can enjoy this the same way they would enjoy a larger trampoline while still having enough space to do a few tricks, and the area they need to move around. 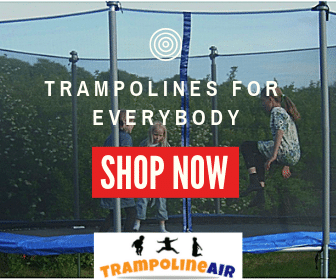 Which Trampoline Should You Buy? Pure Fun offers trampolines for several different age ranges. Buying a trampoline with features suited to your child’s age range will make for a safer playing experience. It’s easy to tell which trampoline corresponds with which age range simply by reading the collection of Pure Fun trampoline reviews. If your child is between age groups, it may be worth investing in the next size up. Doing so means your child will be able to enjoy the trampoline for longer, and you’ll be getting the most for your money.